We never like to think about how our food gets made. It's impossible for factory conditions to be perfect all the time -- and on occasion, there may be an error in food production. This one, however, is especially gross. New York resident Eric Sowa bought a box of vanilla wafer cookies at the chain grocery store ALDI. 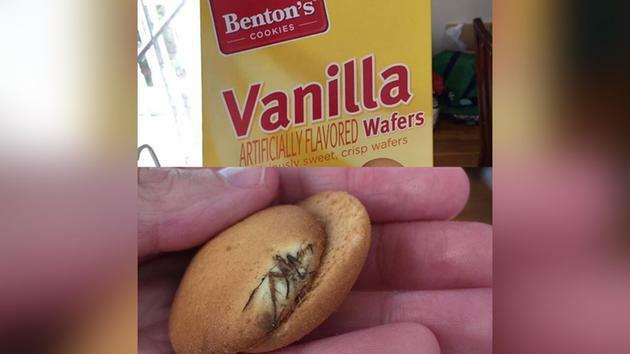 He opened the box when his 9-year-old daughter wanted a snack, and they were shocked with what they found: a bug, what he said to be a spider, baked into the cookie. When Sowa and his wife, Elizabeth, complained to ALDI, the company offered them a $5 coupon and said their particular manufacturer would contact them. According to Sowa, however, there has not been follow-up: "There has been no communication, nor the store saying they would pull any inventory or notify," he told his local ABC affiliate. Sowa also called the notion of a $5 coupon "laughable."